Top-notch reporters open their notebooks and look at what’s ahead in the coming week. NBC News: "Trump agrees to temporarily halt U.S. trade war with China" — "President Donald Trump agreed to temporarily hold his next round of fire in the U.S. trade war with China in order to give Washington and Beijing more time to talk, the White House announced Saturday. "Word of the deal, which essentially sets up a process for more negotiation, came hours after Trump met with Chinese President Xi Jinping on the sidelines of the G-20 summit here and after Air Force One had departed for Washington. "'This was an amazing and productive meeting with unlimited possibilities for both the United States and China,' Trump said in a statement released by the White House. 'It is my great honor to be working with President Xi.' 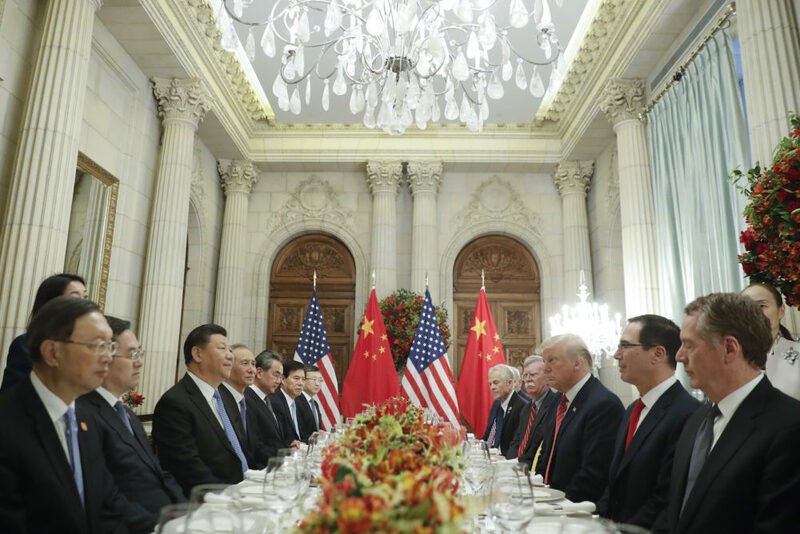 "
Axios: "Trump-Xi dinner puts billions of dollars on the table" — "If President Trump’s dinner with Chinese President Xi Jinping on Saturday at the G20 summit is make-or-break, Trump is giving every indication he’s prepared for, or even prefers, the latter option. "Between the lines: Trump told reporters before taking off for Argentina that while China is interested in striking a deal, “I don't know if I want to do it” because “I like the deal we have now.” He says he’s already planning to raise existing tariffs from 10% to 25% on Jan. 1 — and impose a huge swathe of new ones if the meeting doesn’t go well. Absent a breakthrough, this trade war is about to get brutal." Politico: "Trump assents to shutdown delay" — "President Donald Trump and congressional leaders are getting ready to punt on a major shutdown fight over Trump's border wall for at least a week. "The president said he would back a two-week delay of a government shutdown battle after the death of former President George H.W. Bush. Government funding expires on Dec. 7 for several departments, including Homeland Security, and the president is urging Congress to send him at least $5 billion in border security. But Bush's death has changed the calculation in Washington and appears likely to lead to a stopgap funding extension. "GOP leaders are considering extending government funding for a week or two, according to multiple Republican sources. They are leaning toward one week, pushing the battle off until mid-December. "That's in part because Bush's death and plans for him to lie in state in the Capitol early this week will complicate any efforts to hammer out a large-scale funding deal before the Friday deadline, leading both the president and congressional leaders to seek a longer runway for the shutdown fight." CNN: "Mexico swears in new leftist president" — "Mexico swore in leftist leader Andrés Manuel López Obrador, known as AMLO, Saturday before a crowd that included world leaders and a strong majority in both houses of Congress. "López Obrador won a landslide victory in the July 1 presidential election and began his his six-year term promising to carry out a strong fight against corruption, insisting that the issue has been Mexico's worst nightmare. "'Nothing has harmed Mexico more that the dishonesty of the rulers,' he said. "During his swearing-in, López Obrador reaffirmed his intentions to sell Mexico's official presidential plane and to not live in the presidential palace. He said he will receive 40% of his presidential salary. In an extraordinary move, López Obrador also announced his intention to promote a recall referendum during his administration, adding the promise that he 'will never seek reelection.' "